It’s time for summer living which means families are gearing up for some much-needed time off and fun on the water. The suitcases are packed and the trunks are loaded, now just to get the Sea-Doo ready for the road trip to that perfect destination that you’ve been planning to hit since the cold, winter months. Geared to go: Before heading out of the door, double-check that all of the gear fits correctly. If you’re using the same PFD’s from previous summer fun, it’s possible that some of your family members (kids grow up fast) have outgrown them. If an upgrade is needed, we’ve got plenty of options to pick from to keep everyone safe on your Sea-Doo watercraft. Sea-Doo Nylon PFDs are a great value with higher end components for an ideal combination of comfort and safety. The Sea-Doo Neoprene PFDs matches an athletic riding style and can handle rugged daily use. Sea-Doo’s Ecoprene PFDs have all the advantages of Neoprene plus the quick drying benefit of Nylon. The right PFD will fit snugly and comfortably to provide proper buoyancy while in the water. Water Ready: This may be the first time you’re getting your Sea-Doo watercraft back to the water this season, and if so, now is a good time to get it prepped. Just a couple of months back, we posted our spring-cleaning tips to transition your Sea-Doo watercraft from storage to water. For a quick review of basic inspection and proper cleaning, you can check out that post here. Get your Sea-Doo watercraft prepped beforehand so that you spend all of your vacation time relaxing. Fueled Up: If you’re traveling to a more remote location, we suggest filling up your Sea-Doo watercraft before leaving. This way you can fill up with quality, fresh fuel. It will also assist in towing to optimize the weight distribution. Protection your Ride: We’ve all seen the grime that our vehicles can buildup from long road trips. It’s difficult to clean and is unsightly. Once your Sea-Doo watercraft is prepped, one of Sea-Doo’s custom fit covers will help keep it sparkling all the way to your destination. 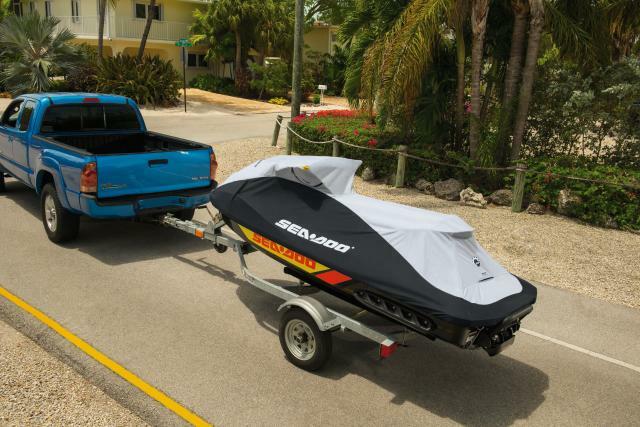 Getting there: As much care should be given to your trailer as your Sea-Doo watercraft that way you can be sure to get from home to vacationing with ease. Check your tires tread wear & air pressure, trailer lights, and have a professional check your wheel bearings. To add a bit more certainty, grab a Sea-Doo Spare Wheel for your Sea-Doo Move I or II trailer. Now, get on the road so you can get on the water! After a cold and extended winter, we cannot be more excited to reunite with some warm weather and get back to riding! If you winterized your watercraft with the basic maintenance, you’re in great shape to get back to the water with minimal prep. Here are a few quick tips to ensure the best performance of your Sea-Doo watercraft and maximum fun this summer. After bringing your Sea-Doo watercraft out of hibernation, it’s a good practice to Clean & Detail to prevent sun damage and remove contaminates from the water. Grab the hose and rinse off with the XPS Boat and PWC Wash and Wax. Made exclusively for Sea-Doo watercraft, this material-safe product will bring back that showroom shine. The long winter months can take a toll on your vinyl seats creating mold and grime from the moisture. Use the XPS vinyl cleaner to help restore your vinyl seat and handlebar pad. Once your Sea-Doo watercraft is looking new again, grab the XPS microfiber towel to avoid scratching and polish to perfection. Inspect all fuel and water lines for cracks or any other types of damage. Always replace any lines that you notice with damage before riding. Check all electrical connections for damage or build up. If any damages are noticed be sure to have them repaired. For build-up, a good cleaning will help reset for riding season. If you did not change the oil and oil filter before winterizing, spring-cleaning provides the best opportunity to do this. The XPS 4-stroke Maintenance and Oil Change Kit includes XPS oil, an oil filter, three NGK spark plugs and an instruction sheet. Spark plugs can develop residue or collect moisture over the winter due to the cold. Check and change your spark plugs if necessary. Make sure your battery has been properly charged and reinstall the battery into your Sea-Doo watercraft. The controls should be checked for proper movement. This includes (steering, steering cable, throttle, throttle cable and iBR, lever). If they stick, use the XPS lUBE so that they move freely. Double-check that your Sea-Doo watercraft is running correctly by connecting it to a hose. Start the engine and run for no longer than two minutes. If you run into any questions during the Spring-cleaning process, always refer to your Sea-Doo owner’s manual or ask your authorized Sea-Doo dealer. Following these simple steps will ensure that you have the best riding season that you can. Now, it’s time to have some fun! Do you have additional pre-riding rituals to share? Share them with us.